Perhaps after a long weekend, you have no interest in seeing a wine bottle. Then again, considering that wine hangovers are relatively benign, you may just be interested in having a spot to store those demon bottles ‘til next go around. Such as the case may be, the wall seems a good as place as any. 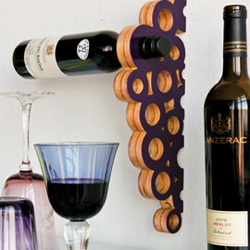 The Grape Wine Bottle Holder mounts to the wall and stores bottles horizontally with no concern for gravity. Hopefully not with the same lack of concern for gravity that was enjoyed on Saturday night.